The First Edition Wild at Heart papers is perfect for this season and Maxine is going to show you how to use these diverse designs on a gorgeous card making project! 1. Print your free template, follow the measurements, fold and cut where shown on your download on a 12x12 sheet from your First Edition Wild at Heart paper pad. 2. Fold your 12x12 Wild at Heart sheet together to create the look of a 6x6 card blank. 3. Secure your card shape by lifting the front flap from the bottom left hand corner and adding double sided tape. Repeat this step on the back flap. 4. With your card open adhere one pocket to the left and right hand side with Double Sided Tape. 5. Create the centre piece for your card by cutting a piece of coordinating Wild at Heart paper to fit the front of your design, ensuring to leave enough room for a border. Next, stick a 5cm wide strip of complementing paper to the centre. 6. Wrap a length of Dovecraft Twine around your layered paper designs. Adhere this to the centre of your card with Double Sided Tape. 7. Die cut the second largest die within your First Edition Scalloped Circle Dies set. 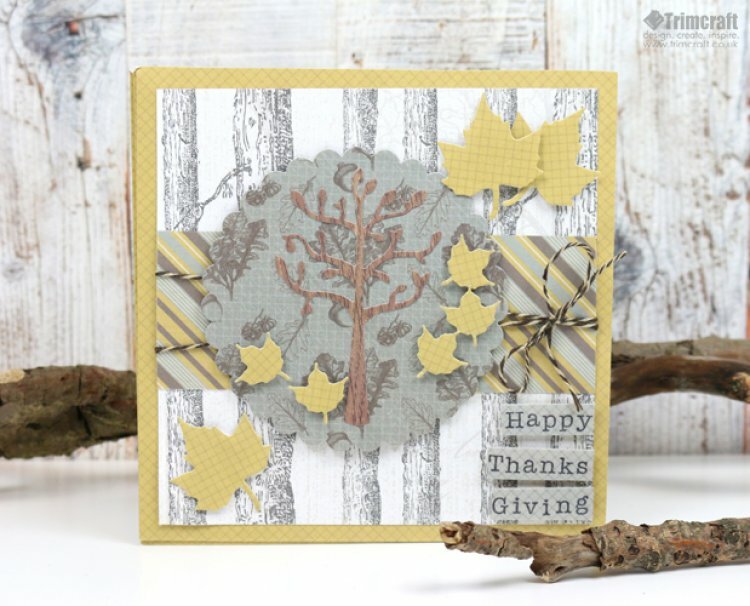 Also die cut the tree and a selection of leaves from the First Edition Foliage Dies set. Glue the tree to the centre of your scalloped circle. 8. Adhere your die cut circle to the centre of your card blank with 3D foam pads to add dimension. 9. Stamp your chosen sentiment using the Simply Creative Alphabet Letters clear Stamps set onto a Wild at Heart sheet. Cut out and adhere each word with 3D foam squares to the bottom right of your card design. 10. Finish the card design by adhering your die cut leaves with 3D foam pads to the centre of your card and in the corners to add interest. 11. To create the tag shape to put inside the pocket, cut a 12cm x 8cm piece of Wild at Heart paper and cut the top two corners. Punch a hole at the top and loop through a length of Dovecraft Twine. Stamp the words ‘For you’ using the Simply Creative Alphabet Letters Clear Stamps set and pop it into the pocket inside your card. This wonderful shape can be adapted for a variety of occasions, simply use a different papercraft collection and you’ll be sure to create a brand new design! We would love to see how you’ve used this pocket fold shape so remember to upload them to the project gallery and to #Trimcraft when uploading to social media.